Weiss Research Reviews - Legit or Scam? Weiss Research Reviews – Legit or Scam? 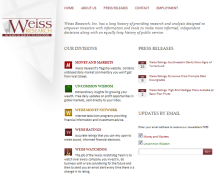 Weiss Research, at www.WeissInc.com, is a financial newsletter publisher that provides research and analysis to their members, so they can make independent decisions about their investment opportunities. Weiss Research, founded by consumer advocate and financial author Martin Weiss, was founded in 1971 and currently has over 500,000 active readers, making it one of the most widely read investment newsletters available. Weiss Research has five different divisions they offer their members, each providing a different service useful to independent investors. It provides two free newsletters, Money and Markets and Uncommon Wisdom. WeissInc.com claims that Money and Markets contains unbiased daily market commentary, while Uncommon Wisdom provides daily email updates on growing your wealth and profit opportunities. The remaining three divisions offer a variety of specific features. The Weiss Money Network provides internet television programs which offer financial and investment advice. Weiss Ratings offers accurate ratings of businesses and other investment institutions, while their Weiss Watchdog feature will send you email alerts concerning the change of ratings on ten different companies you choose to monitor. Generally speaking, financial newsletter publishing companies can be dangerous things. They tend to offer personal opinions as guidance for investors, and they have no legal responsibility to you if you follow their advice and things turn out badly. It’s very troubling that many of these companies let people with no real financial experience or training contribute to their newsletters. In the worst case scenario, many of these companies are paid to bring investors to certain companies. Weiss Research, however, does not accept payment from any company for their ratings or reviews. Still, they are currently using a “Financial Doomsday” video at www.Crisis3.com to market themselves to new customers, which is a questionable tactic. The bottom line when dealing with any financial newsletter publishing company is to remember that you should do your own research regarding where and how to invest your money – never act wholly on the advice of one of these free internet newsletters. Average Rating for " Weiss Ratings " is 1.56 out of 5 based on 107 reviews. give you money to charity or you will become one. Weiss is a disgrace to our religion. Weiss is the worse. Stay away. I too subscribed to the Gold and Silver Trader report. What a scam. This guy can't hit the broad side of a barn. Loss after loss after loss. He misses all the big moves. In fact he can't hit a small move. A real blow hard. Save your money. This is supposed to be a trading service. Your supposed to catch the swings. He can't catch a cold. How could he be any good if he several different news letters he has to be responsible for. Go with a service that is dedicated to one news letter. These people juggle too many balls and are dropping them all over the place. There are many better services out there. Take any of these guys resumes and see if anybody would hire them. Could they work for the Federal Reserve Bank? Yet, I am so grateful to Weiss Research. Thanks goodness they did not hire me. Yet, they block our the sunshine with fear and false hope. See how easy it is to rob people without a gun. These guys sell "paper. "\Do you think anybody would hire them. So why are they successful? It is called media tonnage. They market all over. And when you have these many suckers it is a great business? No wonder Larry is out of the country. Larry Edelson (as well as the rest of the Weiss People) are pathological liars and con men. All the brilliant calls they claim to have made are lies to sucker in new subscribers. They makes tens of millions of dollars off subscribers for services that consistently lose lots of money. Thats why the SEC fined them $2.1M. Larry now lives outside the US to escape further prosecution. If you believe them and follow their advice for any of the Weiss services, you will lose money. Agreed. After years and years of paying for Larry Edelson's failed predictions in the gold market in his Real Wealth Report, I canceled. He's all into "models", "war cycles", phases of the moon, days ending in the letter "y".....the last couple of years he was constantly making predictions and then following up the next month with excuses as to why his predictions went wrong. So much for his models, expertise, divining rods, etc. He knows nothing. That is the price you pay for freedom of the press. If they really know where the market is going, they would not need you. Buy a good financial paper that is legit. Give your money to charity. Not these middle aged guys in Florida. "Moreover, if you think I’ve lost my mind, consider this: My best forecasts have always been accompanied by the same shrill voices of others telling me I’m nuts. When I foretold of the 1987 stock market crash months ahead of time, they told me I was crazy. At the depths of the 1987 crash when I said that the stock market would see new highs merely two years later, they wanted me committed for life. Yet that’s precisely what the stock market did." Makes you wonder how many of his other claims to fame are frivolous or only half truths - unfortunately it's not easy to go back in time and check someones track record. They are a marketing company. They sell fear and greed. Have been with Edelson's Real Wealth Report for a couple years--a topsy-turvy experience; some good gains exited way too soon (MPEL), mediocre advice re gold in 2012 (long DRD, KGC, SA all stopped out as losers; but ZSL & GLL were lucrative); bad PKX pick loser, good ITT results. Fact is, I pick many stocks outside of Edelson's reco's, and couldn't buy all of his choices. Still, I'm pretty sure his Real Wealth portfolio has too many wealth leaks in it, would expect a net loss from his choices. I joined Larry Edelson's Gold and Silver Trader several months ago, and boy have I been dissappointed. I joined because Larry was one of the few gold guru's that called the sharp decline in gold and was warning gold has topped since 2011, and if your a gold trader you know how hard it is to find someone that is not a gold bug or permabull insisting gold only goes up and any minute now it will rocket to over 10K/oz because the world is coming to an end. However, since joining this service Larry is been wrong trade after trade on when to take long and short positions, 95% of recommendations shortly get stopped out. I have only been watching how he works and didn't actually take his advice, luckily. Recently gold just hit a double bottom after the Fed announced tapering end of December 2013 - and Larry had his subscribers going agressive short even though gold was not breaking 1180 and bounced. It is basic TA and common sense that there is a high probability of a forthcoming rally. Instead his "sophisticated" computer models were forecasting declines into January 2014 and a bottom of $950ish. So after everyone already got crushed going short, and missing the big rally in gold and especially miners, he finally gets on the horn and says this is just a sucker rally and "cycle inversion", but also talks out both sides of his mouth indicating the bottom could very well have been 1180 end of Decemeber. At this point he doesn't sound sure anymore on direction and it makes it hard to trust him blunder after blunder, and the last one being BIG. Any other not so great experiences with this service? This is the exact AI Chart Models he is using now in 2016 from 2014 exactly! He does not change his charts only the dates. So his charts showed a low below $1000 for gold, But it only hit $1050. And until this day he will not admit he has missed the bottom. It is now 7/8/16 and Gold is over $1360oz and all miners have gone up 100%-1500%. But get this Larry has not offered 1 single Buy recommendation this year in Gold, Silver, Or Miners. Instead he has his members shorting Gold and Miners since Gold hit $1200 saying Gold and Miners will crash hard and shake out all of 99% of the herd in Gold. And then he tells his members we will back up the truck, When Blood is Running in the streets. Do Not Follow Larry's advice, Even worst is Do Not Give these SCAMMERS ANY MONIES! Me too. I just ended my subscription to Real Wealth Report after watching Larry tap dance for a few years. The last couple of years, his "analysis" can be summed up thus: gold might go up, and it might go down. He's been nothing but a fence sitter, and each issue has been full of explanations as to why last issue's reco's didn't pan out. He's a fraud. Agree on his trading calls, just terrible. When I signed up for Real Wealth Report and a customer service instant messaged me to enroll in the Gold and Silver Trader I should have known that was a red flag. Expensive and crappy advise. See my post above. I currently subscribe to Real Wealth Report. While Larry Edelson correctly predicted the big sell off in gold and precious metals, he has a tendency to move his target prices when the market doesn't do what he predicts it will do. His technical analysis is somewhat complicated and he gives great credence to cycle theory even though it is notoriously unreliable in my opinion. Instead of going with the trend Mr. Edelson tends to fight it as he is now doing with the stock market and precious metals. He has been expecting a huge correction in the stock market for months now but it just keeps going up. Various technical indicators point to the fact that precious metals have bottomed but Mr. Edelson is expecting one last leg down. He could turn out to be right afterall but so far he has been wrong on all accounts.